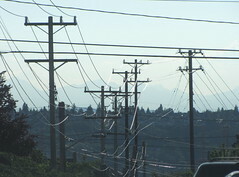 Utility poles in a row on S. Stevens St. Photo by Wendi. The power lines and tall poles that have concerned neighbors in the vicinity of 12th and Stevens will be changed starting next week. City Light crews will install new utility poles along S. Stevens St., as well as replacing the 71-foot pole at 12th Ave. S. and S. Stevens with a 55-foot pole. Additionally, one circuit of power cables will be moved underground to reduce view impacts in the area. The work will begin on June 13 and continue until September. 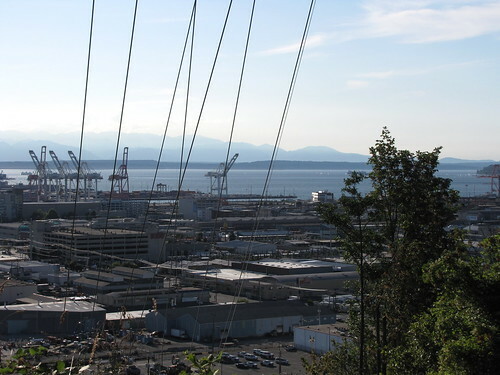 The changes are the culmination of two years of discussions between Beacon Hill residents and City Light after a new power circuit was added to the Hill to support Link Light Rail and expected future demand. When the large poles and new wires went in, neighbors in the area of 12th and Stevens found the views from their homes were affected. Neighbors also expressed concern about the impact of the poles and power lines on the nearby 12th Avenue S. Viewpoint park. Over 100 neighbors signed a petition asking that the poles be removed. These power lines affect views for neighbors at 12th and Stevens. Photo by Wendi. View S. Stevens St. power poles in a larger map. The blue line marks the location of the power poles on S. Stevens Street. The green area is the 12th Avenue Viewpoint park.